The objective was to compare functional outcome in patients with advanced head and neck cancer (HNC) treated with (a) surgical resection and reconstruction with microvascular free flaps (MVFF) followed by radiochemotherapy versus (b) primary radiochemotherapy (RCT) on the basis of the International Classification of Functioning, Disability and Health (ICF) from WHO. This was a cross-sectional, multi-institutional study. The outcome measures included ICF Core Sets for HNC, the EORTC–QLQ, modules c30 + hn35 and the University of Washington-Quality of life Questionnaire (UW-QOL). Analyses included descriptive statistics, ranking exercises, and regression analyses in a cumulative logit model; 27 patients were treated with MVFF and 22 with RCT. Global Quality of life scores suggested a slightly better functional outcome for the surgical approach. The majority of ICF categories (81/93, 87%) did not show a difference in functional outcome between the two treatment approaches. In the remaining 12 ICF categories, n = 3 body structures were more affected in the MVFF group, while n = 3 body functions, and n = 6 activities/participations were more problematic in the RCT group. This included oral swallowing and weight maintenance functions as well as social relationships, acquiring a job, and economic self-sufficiency. In addition, nine contextual environmental factors were more relevant to the RCT group. Both treatment approaches seemed appropriate to advanced HNC from the perspective of functional outcome. The influence of treatment modalities on the social and economic lives of cancer survivors needs to be explored further. In order to guide rehabilitation according to patients’ needs, the ICF offers a multidimensional view comprising body structures, body functions, and activities and participation in life. For calculation with the logit model we thank Cornelia Oberhauser from the ICF Research Branch, Ludwig-Maximilians-Universität in Munich, Germany. For the coordination of study centers within the validation study we thank Elisabeth Linseisen from the ICF Research Branch, Ludwig-Maximilians-Universität in Munich, Germany. The study was part of the validation process for ICF Core Sets for HNC. In this context some of the work, namely the coordination of study centres, was financed through “Deutsche Krebshilfe e.V.”, a German non-profit organization against cancer. For patient recruitment and patient interviews we thank (in alphabetical order): Sebastian Baumann, at Saarbrücken University, Germany, Dept. of Oral and Maxillofacial Surgery. Nuria Blanco-Piñero at University of Seville, Spain, Dept. of Psychiatry and Serafín Sánchez Gómez and Tomás Herrero at University of Seville, Spain, Virgen Macarena Universitary Hospital, Dept. of Otorhinolaryngology. Kirsten Becker-Bikowski, University of Heidelberg, Dept. of Oral and Maxillofacial Surgery. Magdalena Chlabicz and Marek Rogowski at University of Bialystok, Poland, Dept. 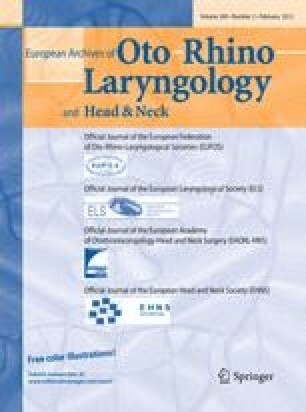 of Otorhinolaryngology. Suzie Forgie and Shirley Pringle at Aintree University Hospital, UK, Dept of Oral and Maxillofacial Surgery. Elma Heitmann Mares Azevedo and Elisabete Carrara de Angelis, Hospital AC Camargo, São Paulo, Brasil, Department for Voice, Speech and Swallowing Rehabilitation. Megan Nutt, ACT Health, Capital Region Cancer Service, Head & Neck Oncology; Canberra, Australia. Yehon Hee Park and Keunchil Park, Samsung Medical Center, Seoul, Korea, Dept of Hematology-Oncology. Rohan R. Walvekar, MD, at the LSU Health Sciences Center, Department of Otolaryngology Head & Neck Surgery, New Orleans, LA, USA.